Middletown, OH – (September 20, 2012) – The Best Of Everything, the Celluloid Society’s 2012-2013 Film Series will launch on September 30th at 1:30 PM with a screening of the 1959 cult classic of the same name in the MidPointe Library Middletown Community Room. 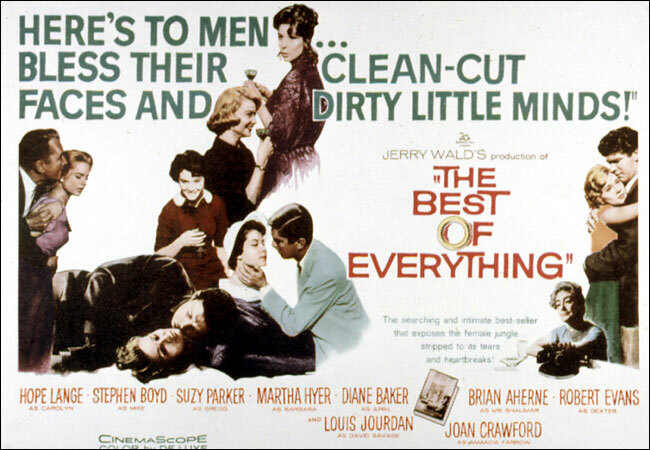 Based on Rona Jaffe’s bestseller, The Best of Everything is set in a time known as “The Fabulous 50’s,” where business executives took three hour martini-fueled lunches and the words “sexual” and “harassment” had not yet been married in our everyday vocabulary. The film chronicles the struggles of three women as they attempt to have a successful career and a happy love life and the stumbling blocks they find along the way. Hope Lange stars as Caroline Bender, a young woman fresh out of college and engaged to be engaged. Thrown into the typing pool of a New York City publishing company, she, along with fellow office gal pals played by Diane Baker and 1950’s supermodel Suzy Parker, must avoid the pitfalls of trying to have it all. The film also stars Joan Crawford, Stephen Boyd, Louis Jourdan and Robert Evans and was directed by Jean Negulesco. The film is an ideal kick-off to this year’s series, which will chronicle working women in a medley of career fields. The series continues on October 28th with Marnie, Alfred Hitchcock’s 1964 psychological thriller starring Tippi Hedren and Sean Connery. The screening on November 25th will be Woman of the Year, featuring Katharine Hepburn as an ambitious journalist. The legendary Bette Davis stars in the January 27th screening of Old Acquaintance. Federico Fellini directed the film Nights of Cabiria, to be shown on February 24th. The poignant drama Imitation of Life will be screened on March 31st. The series concludes on April 28th with Alice Doesn’t Live Here Anymore. Vince Risner, MidPointe Library Associate and coordinator of the series says that he enjoys selecting movies that not many people have seen and has received positive feedback from even the most controversial films. “People like to be challenged,” he states. Risner, a MidPointe Library Middletown Public Library Associate and Founder of the Celluloid Society, is no stranger to the magic of the silver screen. Before launching the Celluloid Society in 2006, he studied fashion and costume design in New York and Paris and designed costumes for stage, film and television, both locally and in Los Angeles. All screenings start at 1:30 PM and are held in the Community Room of the Middletown Public Library. Patrons must be 18 years or older to attend. Admission is free. For more information about the film series, please call the MidPointe Library Middletown at (513)424-1251 or visit the Library’s website at www.midpointelibrary.org. The MidPointe Library System serves a population of almost 200,000 people in the cities of Middletown, Trenton, and Monroe and the townships of West Chester, Liberty, Lemon, Madison, and Wayne with a collection of nearly half a million materials. The main library is located in downtown Middletown, with branch libraries in West Chester and Trenton. For more information, please visit www.midpointelibrary.org or contact Cari Hillman at (513)424-1251 ext. 211 or chillman@midpointelibrary.org.